Muons are about 200 times heavier than the electron. While this larger mass makes them interesting, it also makes them unstable. Whereas electrons live forever, muons exist for only about two microseconds—or two millionths of a second—before they decay. But for particle physicists, who work with particles traveling close to the speed of light, two microseconds is, essentially, forever. We wish to thank Prof. Coan and Prof. Ye for the software we have used and for their work on muons detection which has inspired the present work. Cosmic rays, at sea level, have plenty of muons. They come from the interaction of primary cosmic with nuclei of atmosphere. 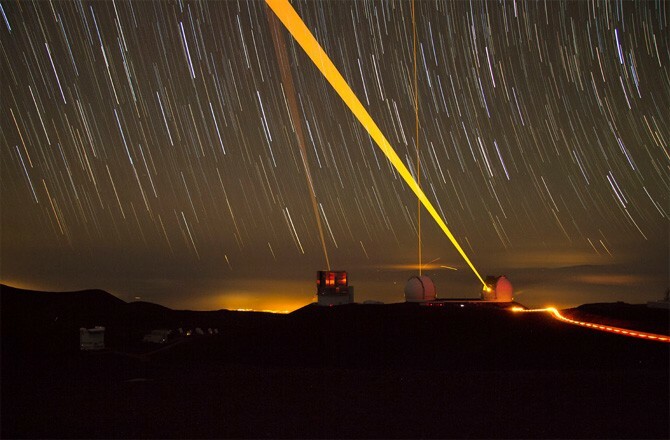 Cosmic muons can be detected rather simply with scintillation detectors and it is also possible to measure the muon lifetime. Now we want to describe the last equipment we built with the aim to measure with precision the muon lifetime. 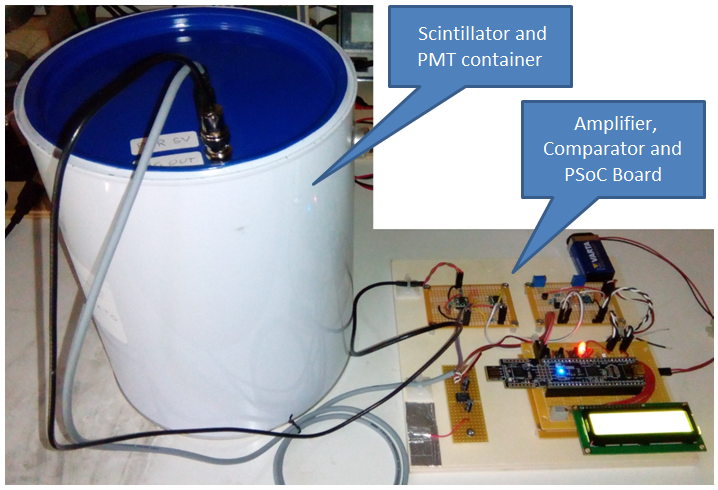 It consists of a plastic scintillator coupled with a PMT and an electronic circuit based on a PSoC which performs the time measure between the muon passage in the scintillator and the muon decay. 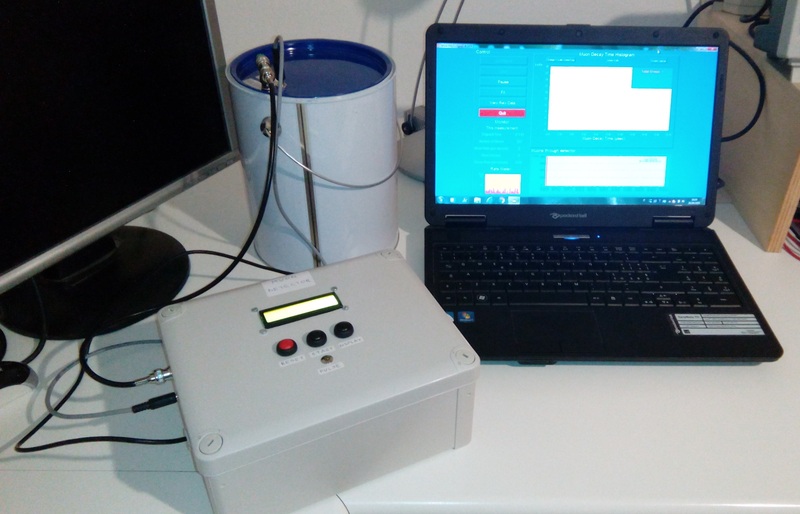 The data are stored in a SD Card and sent via serial communication to a PC which runs the software to acquire data and to make the statistical analysis. The image below shows the generation of the two light pulses (short arrows) used in determining the muon lifetime. One light pulse is from the slowing muon (dotted line) and the other is from its decay into an electron or positron (wavy line). The muons that come to rest then live a relatively long time, on the order of order microseconds, inside the scintillator; but eventually each of them decays in an electron (positron) plus a neutrino and a antineutrino. Nearly all of the rest energy (105 MeV) of the stopped muons appears as kinetic energy of the three particles; on average, the electron (positron) gets a third of this energy, about 35 MeV. (The two neutrinos carry away the rest of the energy undetectably). 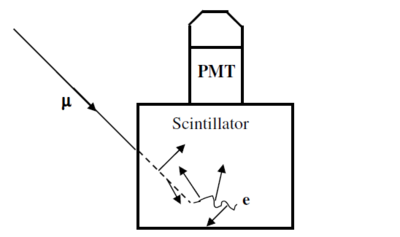 But such an electron is a charged particle, itself certain to cause ionization as it moves through the scintillator. Conveniently, the typical energy deposited in this ionization process is about the same as that deposited by a muon-in-transit, or a muon stopping, so the very same scintillator/PMT configuration is also suitable for detecting stopped muons subsequently decaying at rest. To measure the muon’s lifetime, we are interested in only those muons that enter, slow, stop and then decay inside the plastic scintillator. Such muons have a total energy of only about 160 MeV as they enter the tube. As a muon slows to a stop, the excited scintillator emits light that is detected by a photomultiplier tube (PMT), eventually producing a logic signal that triggers a timing clock. A stopped muon, after a bit, decays into an electron, a neutrino and an anti-neutrino. Since the electron mass is so much smaller that the muon mass, mμ/me ~ 210, the electron tends to be very energetic and to produce scintillator light essentially all along its path. The neutrino and anti-neutrino also share some of the muon’s total energy but they entirely escape detection. This second burst of scintillator light is also seen by the PMT and used to trigger the timing clock. 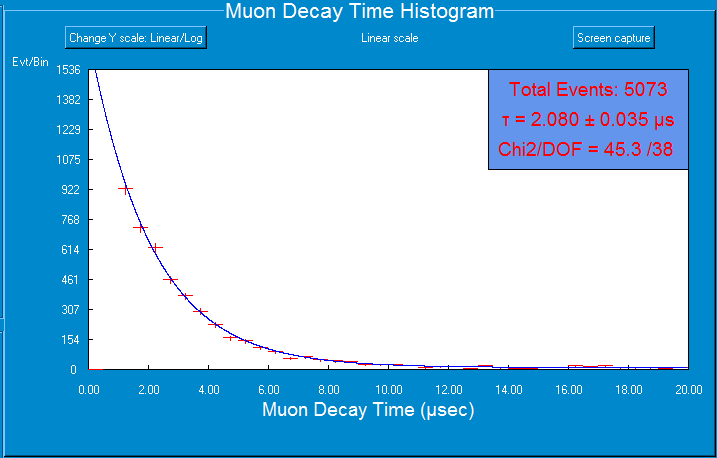 The distribution of time intervals between successive clock triggers for a set of muon decays is the physically interesting quantity used to measure the muon lifetime. 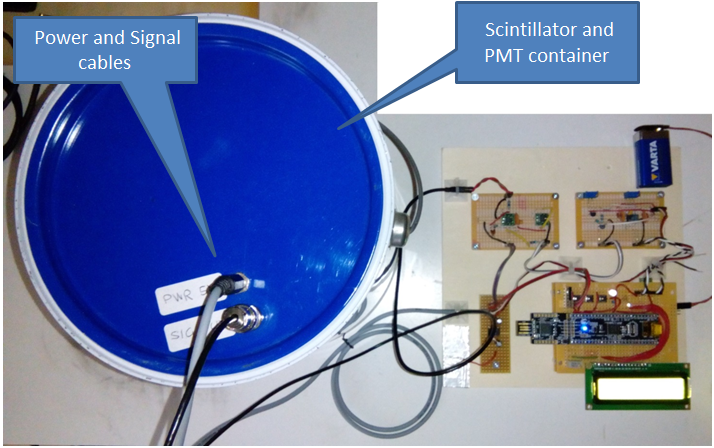 The images below shows the experimental setup with the “scintillator can” and the signal processing electronic part. The image below shows the signal processing chain, from the PMT to the PC for data acquiring and data processing. The -negative- signal from the PMT, which is powered with a high voltage at around 1 kV, is amplified with a trans impedance amplifier (TIA). The scheme below shows the schematic of the TIA, the operational amplifier has to be very fast (wide band op amp) in order to preserve the timing of the original signal produced by the PMT. The signal produced in output by the amplifier is inverted with respect the input, so it has a positive swing from 0 level to about the maximum level of 2 V.
The amplified signal is sent to a fast comparator, with adjustable threshold, which has the aim to produce a square pulse signal for the pulses generated by the muon passage inside the plastic scintillator. 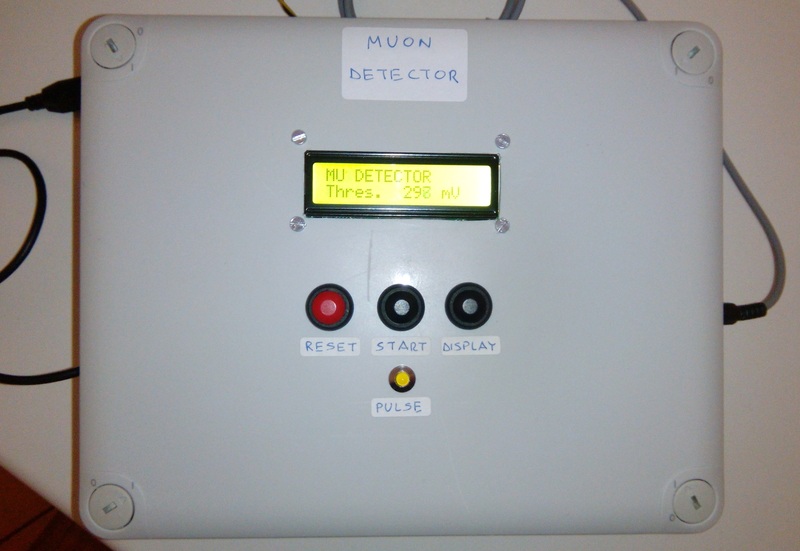 Acting on the threshold it is easy to select only those pulses coming from muons excluding the “noise” from background radioactivity, because the muons generate pulses rather high while the background pulses remain below 100-200 mV. So we set the threshold at 300 mV. With this value we obtain a pulse rate of around 5-7Hz, that is 300 – 400 CPM. The aim of the PSoC component is mainly to acquire the pulse signals from the comparator, count them and select the pulses which are coming from a muon decay; in this latter case the aim is to measure the time interval between the two pulses, the first pulse from the muon and the second pulse from the electron (positron) generated in the muon decay : this duration is the decay time of the muon. The PSoC 5LP (CY8CYKIT-059) has been programmed with the development system PSoC Creator, freely downloadable from the manufacturer’s website. 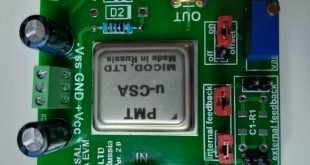 Using this tool, with a rich and simple graphical interface, the chip is programmed and all the used components are defined and configured. The system is synchronized by means of a series of clock signals, the main of which is the BUS_CLK that has a frequency of 50MHz (this frequency is set in configuration and depends on the characteristics of the circuit that is being achieved), it synchronizes the operation of all the components. The period of this signal is 20ns , this is important because it corresponds to the minimum duration of the signals that can be managed correctly by the system. Signals shorter than 20ns may be managed incorrectly or may not be read by the system. In our project we have established for the signals a minimum duration of 40ns, well above the limit of 20ns. 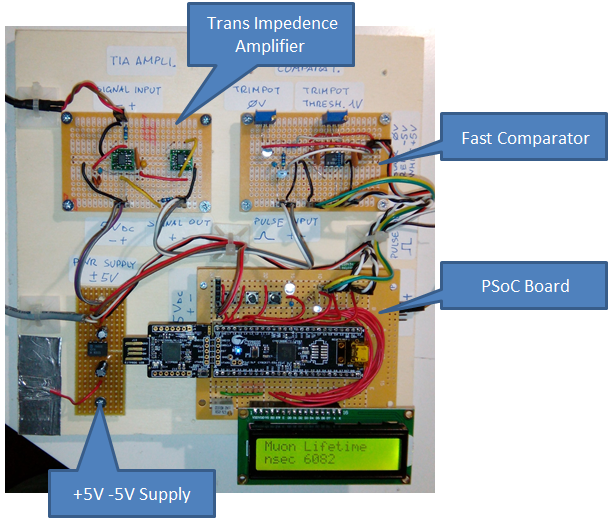 The pulses produced by the fast comparator are the input signals of the PSoC processing chain. Since the pulses may have variable durations, downstream it is placed a D-type Flip Flop with external RC network to obtain a clean pulse of 40ns. The latter also produces a further pulse of 0.01s used to turn on a LED in order to give a visible feedback of the capturing event. The pulses are sent to digital counters which perform the pulse counting. There is also a counter that counts the seconds so as to measure the duration of the counting operations. The time interval between two pulses is measured with a timer. The time interval is measured between the rising edge of the pulses. In the picture below you can see the typical PMT pulse produced by the muon passage in the scintillator. The FWHM is about 40ns, while the amplitude is about 200mV. The picture below shows various PMT pulses, with amplitude ranging from 100mV to 300mV and duration ranging from 40ns to about 120ns. 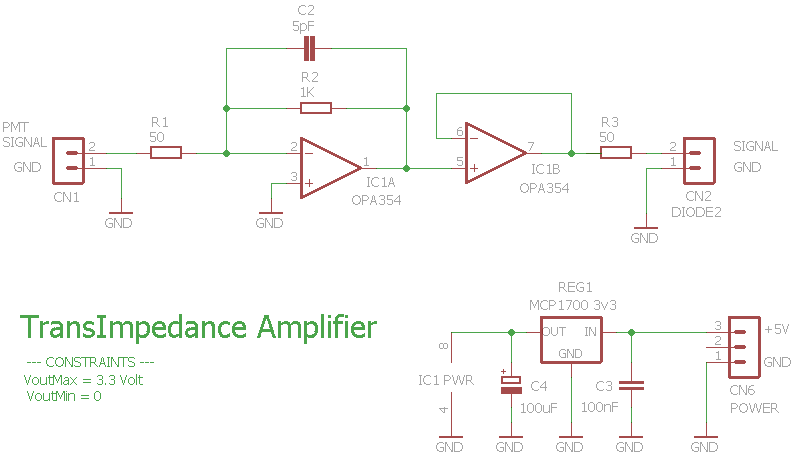 The picture below shows both the PMT pulse and the output pulse of the amplifier. The duration is the same while the signal amplitude, positive, goes up to 1,5V. 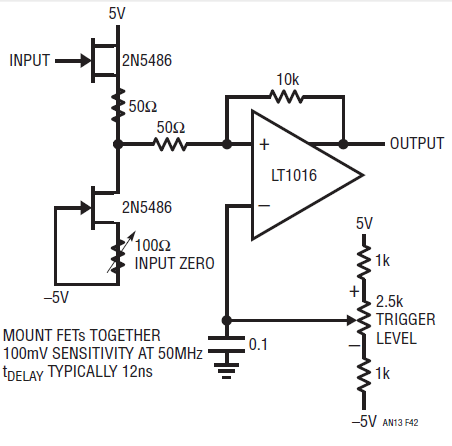 The picture below shows both the PMT pulse and the output pulse of the fast comparator. 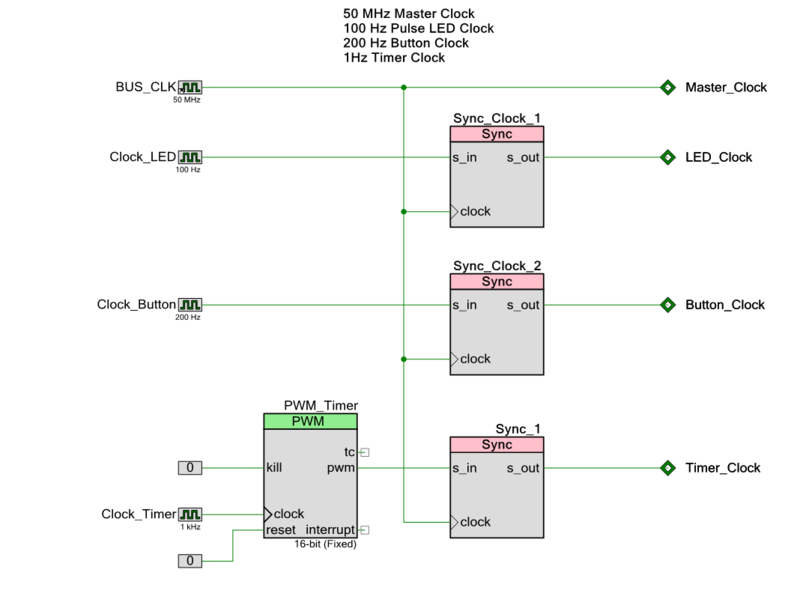 The picture below shows both the PMT pulse and the 40ns pulse generated by the PSoC. The latter is delayed with respect to the PMT pulse of around 40ns. The picture below shows the jitter of the 40ns pulse generated by the PSoC. From the traces it can be estimated in less than 20ns. 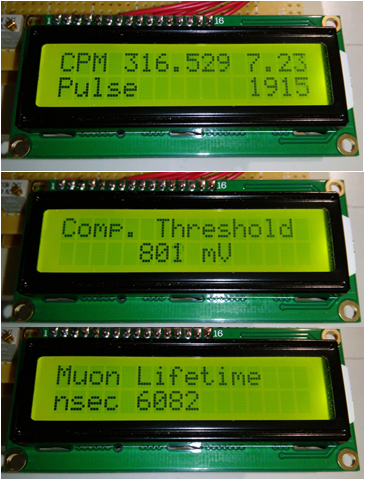 The picture below (obtained increasing the persistence of the scope display) shows the muon pulse plus two pulses generated by the muon decay and the corresponding PSoC pulses. The PSoC board is interfaced to the PC by means of a serial communication. 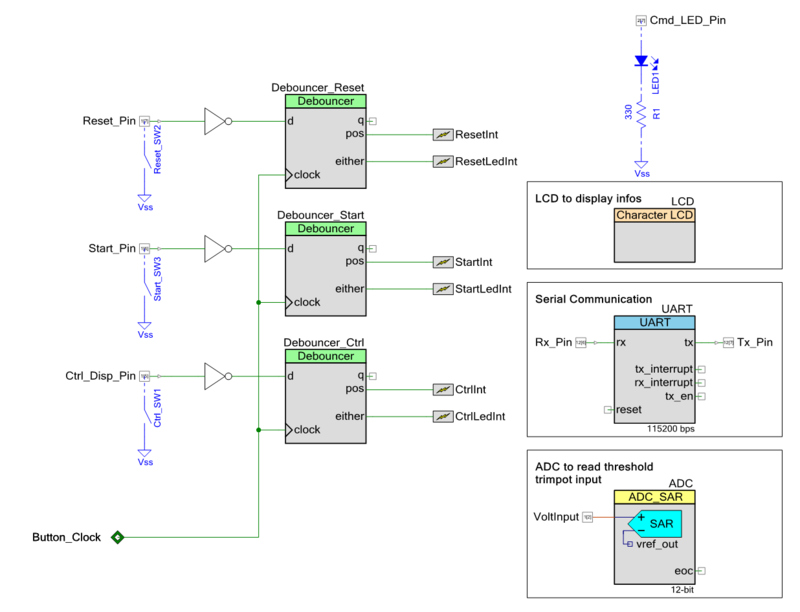 In the PSoC project this is done with the UART component. The serial connection is the same connection used for programming and debugging. 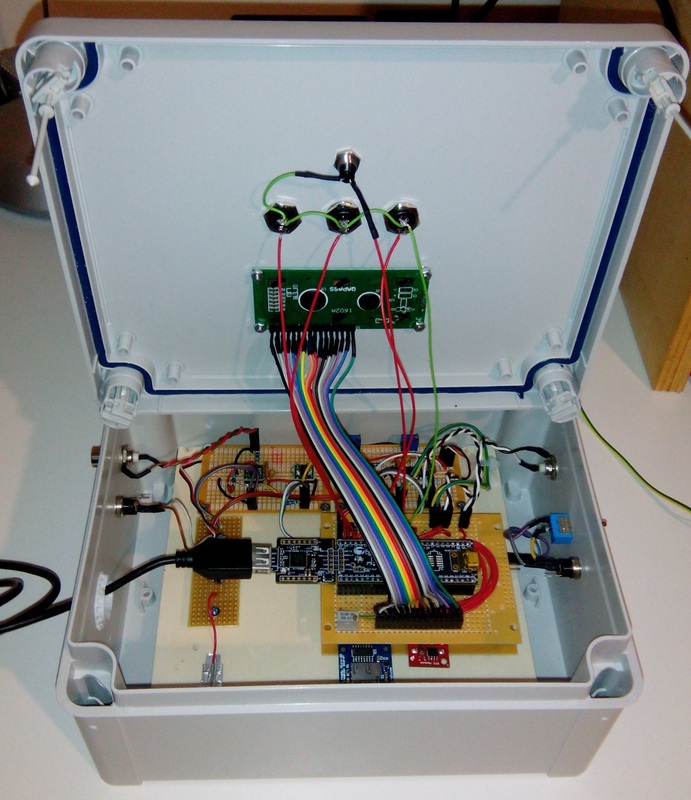 The image below shows the entire setup with scintillator, electronics and PC for data acquisition. The software used for data analysis is the application realized by Prof. Coan and Prof. Ye which can be downloaded, with documentation, from their site www.mtphys.com. The image below is a screenshot of the software. The application reads and records the data which are sent from the PSoC. 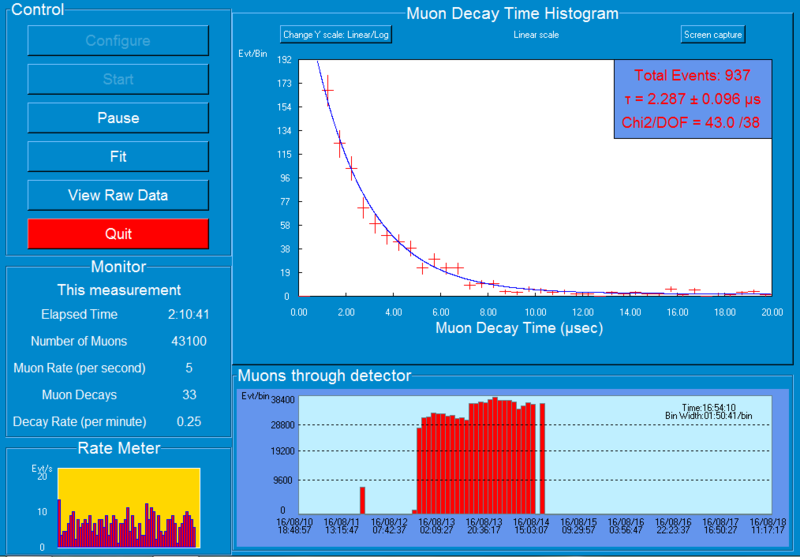 It performs the counting of muons, the counting of muon decays, it calculates the rates and, mainly, it fits the decay data with exponential law determining the muon lifetime. In the image below we report the results after collecting about 5000 events. This value is between the value measured in vacuum, 2.197 μs, which is valid for the positive muons and the characteristic value of negative muons equal to 2.043 μs, slightly less because of the interaction of negative muons with nuclei of the scintillator. The measurements are in excellent agreement with the expected and predicted by theory.